This is master Basho, the great Japanese poet who invented the haiku as we know it: a tiny poem filled with a love of nature. He spent his life close to nature. After a year in 1683 during which his hut burned down and his mother died, he took to the road. From the age of forty (in 1684) he travelled from place to place, like a tramp or wandering monk, walking through the countryside, living by teaching poetry in each town or village where he stopped. His attitude to nature was humble, selfless, and deeply respectful. He said, "Go to the pine if you want to learn about the pine, or to the bamboo if you want to learn about the bamboo. In doing so, you must leave your preoccupation with yourself. Otherwise you impose yourself on the object and do not learn. Your poetry issues of its own accord when you and the object have become one – when you have plunged deep enough into the object to see something like a hidden glimmering there." One of Basho's fans, a poetry student, came to him and said, "I've got a great idea for a poem! It goes: 'Pull the wings off a dragonfly, and look - you get a red pepperpod!'" Basho said, "No. That is not in the spirit of haiku. You should write: 'Add wings to a pepperpod, and look - you get a red dragonfly!'" Cruelty, violence and sensationalism have no place in haiku poetry. The natural processes of suffering and death do, but the attitude to creatures that suffer is compassionate. Count the syllables in the Japanese. It is in three sections – how many syllables are there in each? (A syllable is the smallest complete unit of sound in a word. To-day has two; to-mo-rrow has three; yes-ter-day has three; now has one). Now count the syllables in each of the English translations. One matches the Japanese in line-length, and the other does not. The Japanese syllable "ya" is a "cutting word." In these versions it is translated as an exclamation mark, or a dash, or a comma. It splits the poem into two sections. Natsu-gusa, "summer grasses," is the season-word. A traditional haiku always had a season-word. Now you know the basic elements of the form: seventeen syllables, a "cut" or "break" splitting the poem into a one-line and a two-line unit (usually), and a season-word. Which translation do you prefer, the longer or the shorter? Give your reasons. Japanese haiku have seventeen syllables in three lines of 5, 7 and 5 syllables. Some English translators stick to this same syllable pattern in English (as in our first example above), and this is called in English strict-form haiku. Many translators, however, feel free to use any short verse, usually shorter than seventeen syllables, and this is called free-form haiku. For more detail on formal approaches to the haiku in English, including arguments for seven-stresses, six-stresses, 3-4-3 or 4-5-4 syllable patterns, and four-liners, please see the articles on Form. Basho told his followers that the experience the poem was based on was more important than fancy or clever language. The poet should be absorbed in nature. The poet should not show off in the poem. He told them to aim for simplicity with elegance in expressing the "haiku moment," the truth of the original noticing. He tried to describe what he meant by the spirit of "lightness" applied to both the subject and the form of the poem. He said it should "give the impression of looking at a shallow river with a sandy bed." It is difficult to understand this, and he was disappointed that his followers did not seem to get the idea. At this point he was close to death, with little time left to teach them. His "Way of Poetry," the path he had chosen for his life, was an absolute commitment to seeking religious enlightenment through working at haiku, and he wanted his disciples to understand that the finest form of it had a spirit of "lightness." Basho died over 300 years ago, on the road, in a remote part of the country, in autumn. He lay ill with stomach pains for several days, and his admirers came from far and wide to see him. One of his disciples took down his last poem, which in Japanese tradition is important as the "death poem." 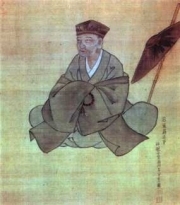 Basho also dictated a different poem with similar imagery, but the disciple did not hear the first line and did not dare ask Basho to repeat it, since he seemed too ill to speak without great pain, so it is now lost for ever. The haunting phrase of the two surviving lines is: "roaming still / my dreaming mind." Basho wrote a note to his brother: "I hope you will complete your full life in peace and calm. There is nothing more I have to say." On his last day he slept all morning, woke at noon, and showed his characteristic amused sympathy with little creatures: "Those flies seem delighted to have a sick man around," he said. In the afternoon he clasped his hands and murmured religious verses from Buddhist sutras, and died.